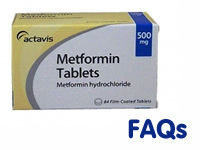 Although one of the most common drugs for type 2 diabetics, Metformin can still confuse diabetic patients. This set of FAQs are intended for information purposes, and should not replace or supersede the advice of a doctor or qualified medical professional. If you have a question about diabetes and Metformin that is not covered here, please ask the community in the Diabetes forum. Should all type 2 diabetics take Meformin? One side effect of taking Metformin is lactic acidosis, and for this reason some diabetics should not take Metformin unless specifically advised to do so by their GP or diabetes healthcare team. For this reason, diabetics with kidney problems, liver problems, and heart problems are often advised to avoid Metformin. Similarly, diabetics that are dehydrated, drink alcohol a lot, or are going to have an x-ray or surgery. For some pregnant diabetics, Metformin may not be the best choice, but in all instances this should be discussed with your doctor. Can young diabetics take Metformin? Metformin has been proven in clinical trials to lower glucose levels amongst children between 10-16 years of age suffering from type 2 diabetes. Research is less conclusive about children under 10 and children taking Metformin alongside other treatments, but your diabetes health care team should be able to elaborate on this. How much Metformin should I take? This will depend entirely on your condition, and your doctor will be able to tell you how much Metformin to take, when you should take it, and how you should take it. Usually, diabetics start out on a low dose of Metformin, and this is slowly increased until blood sugar responds. Doctors often put diabetics on combination courses with other medication, including insulin. If I take Metformin, can I stop my diet and exercise? Absolutely not, Metformin should be used in combination with a diet and exercise programme for the best results. Your doctor should advise you of any changes that can be made to diet and exercise. What are the symptoms of Metformin causing serious side effects? Diabetics taking Metformin should contact their doctor immediately in the event of dehydration that can be caused by an illness involving vomiting or diarrhoea. Should I avoid anything whilst taking Metformin? Diabetics taking Metformin should avoid drinking a lot of alcohol, both regularly and in short episodes. Alcohol consumption can up the risk of lactic acidosis. In some cases, Metformin can lead to a buildup of lactic acid in the blood referred to as lactic acidosis. This side effect is rare, affecting about one in every 30,000 Metformin patients. However, although uncommon, lactic acidosis amongst diabetics can be fatal. What are symptoms of lactic acidosis? Any sudden changes should be reported to your doctor instantly. Other side effects include diarrhoea, nausea, upset stomach and flatulence. Taking Metformin with meals can help to diminish these side effects. Some diabetics experience an unpleasant metallic taste when taking Metformin. I am pregnant and taking Metformin, what should I do? Contact your doctor immediately and tell him or her you have become pregnant, or if you are planning your pregnancy let him or her know in advance. Experts advise that pregnant women should not take Metformin during pregnancy.